Despite the plethora of modern equipment in a Japanese kitchen, the cookware that has made the biggest comeback in recent years has a long history that can be traced back to prehistoric times. That’s the donabe, a lidded, heatproof earthenware pot with a matching vented lid. The shelves of trendy cookware stores are lined with a huge array of donabe at this time of year as the weather turns cooler. There are even restaurants that specialize in donabe cooking. The biggest reason for the return of the donabe is the ever-increasing popularity of nabe, tabletop hotpot cooking. Just like a pot roast or a roast chicken may evoke warm memories of happy meals in other parts of the world, a nabe is the quintessential family meal in Japan. Another reason may be that donabe come in so many colors and designs these days, from the colorful and modern to the traditional. They look great on the table as well as being practical cooking containers. 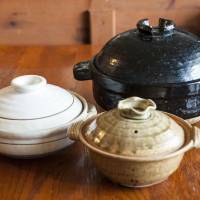 Donabe aren’t just for tabletop cooking, however. Because of its thick clay walls, a donabe retains heat very well, so that food will both remain warm for a long time and also continue cooking in residual heat. Many people swear that the best-tasting rice is cooked in a donabe, since each grain stays firm yet still just sticky enough, cooked through evenly and tasting good even when cold. Donabe are also ideal for the slow, gentle cooking of stews, soups and nimono (simmered dishes). They can be used for steaming and even smoking, too. There are a few things to consider when purchasing a donabe. The first is the size, as donabe range from tiny single-serving pots on up. For smaller donabe to be used at the table, a good rule of thumb is to get one that’s just a bit bigger than you think is necessary. Another variable is the finish of the earthenware — a donabe may be glazed or unglazed on the exterior and interior. Glazed finishes are much easier to keep clean, but donabe with rough unglazed finishes retain heat a lot better. Except for a couple of small tabletop donabe, I like glazed exteriors with unglazed interiors; those interiors do get stained over time, but that just speaks of the pot’s history. The shape of the donabe is important too. Shallow ones are best-suited for tabletop cooking since it’s easier to get into the contents, while deep ones are suited for cooking rice and so on on the stove. Last but not least, if you have an induction cooker, be sure to get a donabe with special adapter plates; the plates can also be purchased separately. When you get a new donabe, the first thing you should do (if the interior of the pot is unglazed) is cook some rice porridge (kayu) or boil some rice rinsing water in it. The starch in the rice is supposed to help seal the interior of the pot and prevent it from cracking. Any mixture of starch and water will do, such as corn or potato starch dissolved in water and heated gently. This method has also been used traditionally to temporarily stop donabe with fine cracks from leaking. You do need to be a little careful with a donabe if you want it to last. Never let it boil dry, make sure the bottom of the pot is not wet when you put it on the heat, and never try to cool the pot suddenly by plunging it in cold water water, for instance. And, of course, be careful not to drop it! 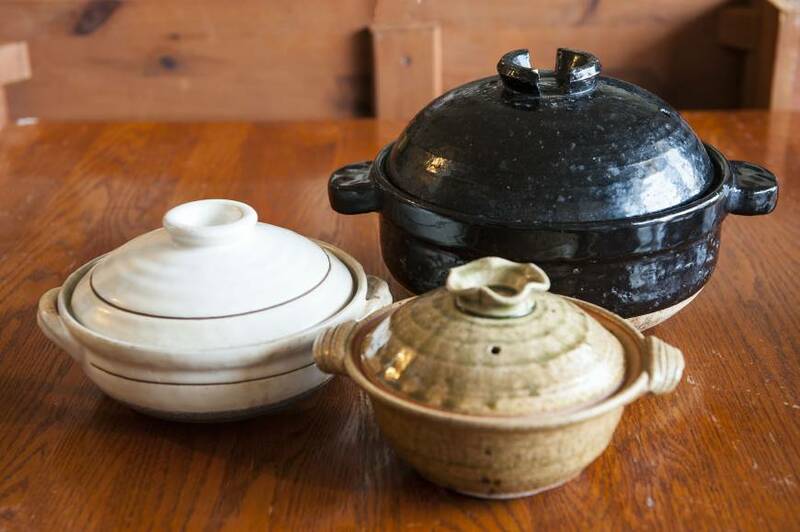 With some care, a good donabe may become a treasured family heirloom. This is the last in a six-part series exploring traditional and modern equipment connected to Japanese kitchens.